So the big day is finally here. Will patience be a virtue, or won't it? Macro Man's hunch is that the Fed will keep the door ajar for a midyear rate increase, but maintain a pretty high bar for doing so. Judging by yesterday's survey results, he has plenty of company. 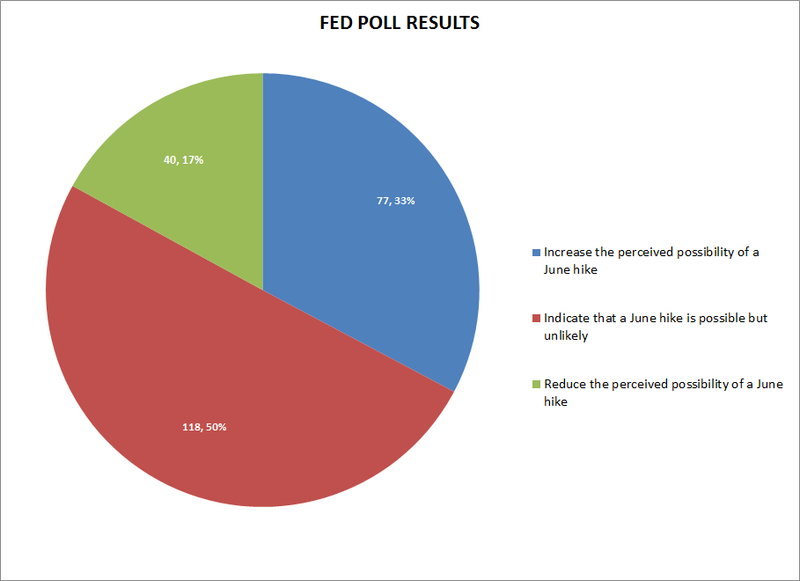 Fully half of you opted for answer C, "Indicate that a June hike is possible but unlikely." Only a third of you thought that the market's perceived probability of a rate hike in three months' time will increase as a result of today's Fedapalooza. In terms of his portfolio, Macro Man has decided to more or less sit tight. As discussed yesterday, he has a bit of a barbell on, with positions in those assets most and least priced for a hawkish outcome. Judging by both the poll result and yesterday's little short-covering flurry in EUR/USD, a bit of a damp squib today would not come as any real surprise. Macro Man's positions are pretty modest at the moment, so he's willing to wear a little bit of short term pain if it means getting better entry levels to reload. Your author was intrigued to see the flurry of press attention paid to Ray Dalio's warning on a 1937 repeat from the Fed. Only a few miles separate Macro Man's office from Mr. Dalio's, though the distance between their respective places in the financial universe is obviously substantially greater. Still, Mr. Dalio is a famous adherent of brutal honesty, so Macro Man can't help but observe that he thinks Mr. Bridgewater, a man who's been known to hold the odd bond or ten billion, is talking his book a bit. Although Macro Man has not read the verbatim text of Dalio's missive, based on press reports it seems to him that Dalio is falling prey to the fallacy of the false dichotomy discussed last week. The Fed can raise rates modestly and still maintain easy financial conditions, even if the feedback loop between the policy rate and overall financial conditions is swifter and stronger than it was in the past. Moreover, "we can't raise rates because it might precipitate another crisis" is a counterfactual that can neither be proven or disproven unless someone's willing to give rate hikes a go. What we can say, however, is that there is no room for orthodox policy easing should the need arise from current policy settings. And of course, if unorthodox measures were all that effective, Mr. Dalio wouldn't be sitting here in 2015 fretting about the economy's ability to withstand any tightening whatsoever! While growth in the rest of the world has clearly been anemic since the onset of the crisis, it's worth reminding ourselves that anemic is a damned far way from catastrophic. 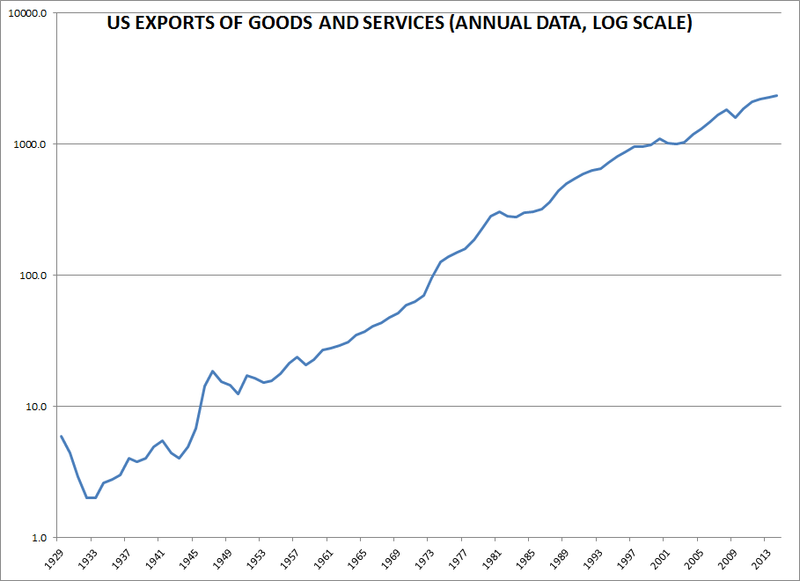 In 1937, US exports of goods and services were only 2/3 of their pre crisis peak. Last year they exceeded 2008's levels by 26%. 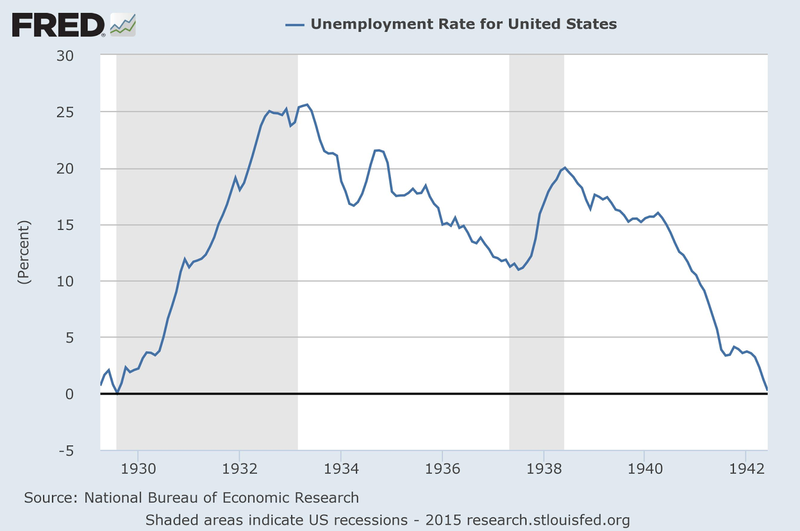 Finally, let us note that the Fed tightened policy in 1937 as the unemployment rate tumbled from a Depression high....all the way down to 11%! Lest you have forgotten, the peak unemployment rate during the Great Recession was 10%. It's true that U6 was as high as 17% a few years ago....but we also don't know what the equivalent would have been in the 1930's. Regardless, in 1937 the unemployment rate had only retraced slightly more than 50% of its rise from the pre-crisis trough, substantially less than it has done over the past five years. None of this is to say that tightening won't have some negative repercussions- after all, you can't make an omelet without breaking a few eggs. On the other hand, Japan offers a salutary lesson that perma-ZIRP is no buffer against economic downturn or financial crisis. Unlike Japan, the United States has returned to solidly positive nominal GDP growth (albeit lower than pre-crisis trends.) Perhaps the question that Mr. Dalio really should be asking is what he'd like the Fed to do when the next downturn comes (and come it will, ZIRP or no ZIRP): cut rates from 2.50%, or push on a string? There will not be another downturn. It's well known that no less a personage than Gordon Brown (Cancellor of the Exchequer) cancelled the boom and bust cycle. After all Carney's talk (bs) about rate hikes, it's interesting to see the BoE just confirm their weak monetary policy this morning. Expect the same from Janet later. 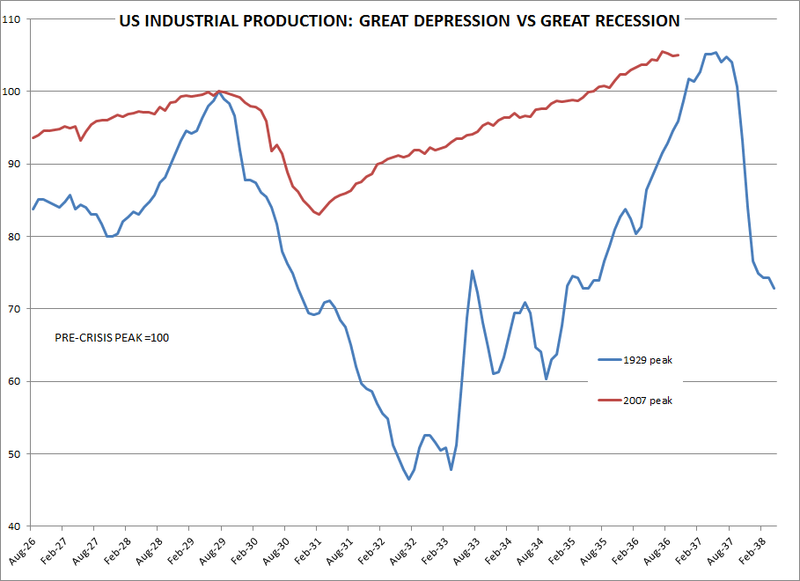 "It's true that industrial production is roughly 5% above its pre-crisis peak, the same level as it was when the Fed started tightening in 1937." That"s true alright , ya wanna shake on it?...The Feds chief chairwoman is surrounded by one of the best resource teams in the world and never has to worry about where the data comes from or how it's manipulated.But I'd love to see the chief at a proprietary trading desk. MM - excellent analysis as ever, thanks VM. Thanks MM - I am neither a fan nor a critic of Dalio, but my interpretation of his missive was slightly different. I think the 1929/1937 analogy is being played out in asset-land and not real-GDP ville, as it were. There has been a wink-wink attempt to deleverage by getting equities up this time around, and I would humbly suggest this is a bit more geared to rising rates than the fate of soap factories in the early 30's - so the point is the Fed not keeping the foot pressed to the accelerator all the way till the S&P500 hits 3000 could jeopardize the one and only way bernankonomics did work. "We are all set for rate hikes in june, but will be really patient afterwards and then patiently and slowly treat this patient of an economy so that it patiently recovers...YOU HAPPY NOW ALGOS????" Moreover, I find the argument that "Spooz and bonds are the only thing keeping the economy afloat, to derail them now is suicide" argument to be unimpressive, as you can always use it to make a case for ongoing ZIRP-world. And if the potential fallout from a correction from SPX 2100 is too terrible to contemplate....what will it be like at SPX 3k, with an even greater wedge between valuations and economic reality? Call me nieve, but is it really tightening if the Fed has rates at 1 or 2%. That used to be called easy money before. Yes on the margin its tightening, but if long rates stay low, housing should be fine. And when the CPI rebases next year from the oil drop, we should go back to 2% inflation, thus around 0 real rates . how about unwinding the balance sheet by selling the treasuries before hiking. "Moreover, I find the argument that "Spooz and bonds are the only thing keeping the economy afloat, to derail them now is suicide" argument to be unimpressive, as you can always use it to make a case for ongoing ZIRP-world." "And if the potential fallout from a correction from SPX 2100 is too terrible to contemplate....what will it be like at SPX 3k, with an even greater wedge between valuations and economic reality?" Couldn't agree more, but if the purveyors use a 1.0 % 10 yr yield (the logical denouement of zirp forever in a disinflationary world), I would like to point out that spy at 3k would still handily beat on yields. As for the wedge between valuations and economic reality, you and I debating that would be like a fixed mud wrestling match between diogenes and crates. @abee- This is my point over the last week or two. Just because they leave ZIRP does not mean that they leave accommodative/easy conditions! @ Anon- hoo boy, can you imagine what the Dalios and Gundlachs would say to that? My last comment was directed at chegawara. @ washedup- I would submit that inflation is poking us (via paper assets), just not as defined by central banks. I get the argument on equity valuation. My model still likes 'em. But oh man, justifying everything on the basis of relative valuations....golly what could go wrong there?!?!?! Ray Dalio: "To be clear, we don't know—nor does the Fed know—exactly how much tightening will knock over the apple cart. What we do hope the Fed knows, which we don't know, is how exactly it will fix things if it knocks it over. We hope that they know that before they make a move that could knock over the apple cart. Please understand that we are not sure of anything but...we do not want to have any concentrated bets." All of which is eminently reasonable. However, just because they don't have "concentrated bets" doesn't mean they don't own an absolute truckload of bonds and other assets that might fare poorly in a tightening of monetary conditions, so I suspect there is still some book-talking going on here. An attempt of a here and now forecast of real GDP from Atlanta FED. Not looking good. LB enjoyed reading all of the above, which was very erudite and articulate. Market reaction to the Fed will as ever be determined by positioning, appropriate or otherwise, in the short term. What people will do in response to the new Dot Plot is far from clear to me, so therefore it's best to have no position whatsoever in US equities or bonds. Over the longer term, where are we going? Apologies in advance for long-windedness, as I digress from the here and now. LB is an über-cynic, and believes that we live in an age of deceit and propaganda. Carney's rate hike last year was bluff. What is going on between Frankfurt and Athens is bluff. What is going on at the Eccles building today is bluff. The FOMC will not raise rates any time soon, and in fact, the first real change in monetary policy will probably come much later when some of the MBS and USTs are allowed to mature and are not reinvested. The balance sheet was the last tool to be implemented, via QE, and it will be the first to be very gradually removed. One must remember this - Tantrum or no Tantrum - we have yet to see any significant decrease in the balance sheet. The main benefit of the FOMC's 2014-5 bluff has been to assist the EU and give it some breathing space to cope with its problems via currency adjustments. In a few short weeks, it will become apparent that the US economy is weak and that the FOMC hike is a mirage - much like the much-ballyhooed BoE hike of 2013 that never happened, or the several phantom BoJ hikes over the years. Currency markets will begin to reflect this soon, the USD will fall, as did GBP last year, commodities and EMs will see some relief, and the Euro will do more than stabilize at this level. This is why I like EU equities, EM debt, gold miners and non-US oil companies here. I know this is a minority view, but there have been minorities of one here before. Not to be too dark, but it's important to see the world as it is, not as we would like it to be, or to extrapolate the world to a target based on two prior data points. What Ray Dalio called the "D-process" [D for deleveraging] is going to be a very very long slog, and we may only be in the early innings of a 20-25 year Slough of Despond, of demographic origin. When the historians finally write the history of this period at the turn of the next century, with the benefit of all the files finally being open [thanks to new FOI laws bolstering the constitution and the DOJ closing down the Stasi-like NSA], we will see this era in a different, and much darker, light. At some point we will find out that there was a big meeting in 2008-9, of politicians, bankers, the Fed, State Department spooks, big business CEOs and media. It was announced that we were going to enter a 2nd global Great depression due to demographics, and that in order to get through it we were going to pretend it wasn't happening. Extend and Pretend involved TARP, ZIRP, QE infinity, and amending many of the Employment, Housing and Industrial Statistics, Stalin-style. We can't see the lies that clearly now, but if you watch carefully you can see that almost everything on CNBC and CNN or in the WSJ is now economic and political propaganda. This is an Age of moral Darkness. This is Orwell's "1984" on speed. @LB, I am with MM on the short term economy trend here. The warm March will bring some good data back in the near future. Then there is the lack of aggregate demand/too much aggregate supply problem. But I share your sentiment on USD bulls. I still believe that FED is likely to raise rates this year, just to have some breathing room for themselves to be ready for the next crisis. IMO, Fed is better off to raise rate today, and add some ultra soft statement that they are unlikely to raise again for a very long time. So everyone can move on. There would have been some bloods for a few days, but then a lot of entry points as well. "We kill people based on metadata"
Although the "patient" anthem was withdrawn, this is backpedalling of the first order. No need to look further than recent weak data (except payroll) ,USD strength and EM stress to provide an explanation. The PM complex might have seen the worse of the hedging assault by miners front running an hawkish FOMC and could bottom nicely à la 2006. So now just wondering how much and how sustainable thrust these new dovish growth expectation and lower "normal unemployment" revisions are going to provide for the risk-on crowd. It seems the expectations were a lot more hawkish in all risk assets and the dot plot is falling across the chart. I hate to sound like a broken record but is the EM debt/UST/gold miners trade a/the performer of the year? MM, looks like Happy Days are here again !! Well, LB would have to say that today's action was all rather predictable. Removal of the word "patient" was more than balanced by a more dovish Dot Plot, and Dot Plots are now to be data-dependent. hipper, LB is not going to put the bunting out just yet with regard to EM debt/GDX/RSX/European oils etc... but this little squeeze is certainly a good start. Today's action reveals once again that speculator positioning was excessively short US10y and excessively long USD. From financial twitter: "Why is everyone surprised by the Fed's move? It was obvious rate rises would be kicked into the long grass. Dollar was far too strong." Excuse the extra posting, but amid the USD crash, and my nap on the sofa, I've been rather busy. As such I've only just read LB's post (Mar 18 3:42 PM) above. Excellent post sir! I agree entirely.